Objectives: Evidence indicates that regular physical activity has positive effects on the mother’s health and outcomes of pregnancy. The measurement of physical activity during pregnancy is required for planning and developing health-related interventions. The aim of this study was to evaluate the psychometric properties of the Persian version of the pregnancy physical activity questionnaire. 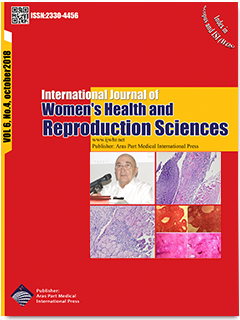 Materials and Methods: This cross-sectional methodological study was conducted with a sample of 200 pregnant women living in Tabriz. Women with low-risk singleton pregnancies in the age range of 20-40 years were included in the study. Sampling was carried out using a multistage sampling method in healthcare centers. Exploratory factor analysis (principal component analysis with varimax rotation), multivariate analysis of variance and Pearson correlation were used for data analysis. Reliability and internal consistency of the questionnaire were assessed using a test-retest method with a 2-week interval and Cronbach’s alpha coefficient, respectively. Results: A five-factor model was developed: ‘vulnerable people’, ‘activities related to work’, ‘home’, ‘sports’ and ‘activities related to leisure time’. They accounted for 43.32% of the observed variance. The Cronbach’s alpha coefficients of the entire instrument and domains were 0.879 and 0.83-0.93, respectively. The Intra-class correlation coefficient (ICC) was equal to 0.857 (CI95% = 0.75-0.93) indicating proper stability of the questionnaire over time. Conclusions:The Persian version of the pregnancy physical activity questionnaire is a valid and reliable tool for examining the risk of physical activities among Iranian pregnant women.